For the active medical or dental office, get your message out there before your patients step up to your reception desk by posting this 4” x 6” Please Check in Here Engraved Sign. 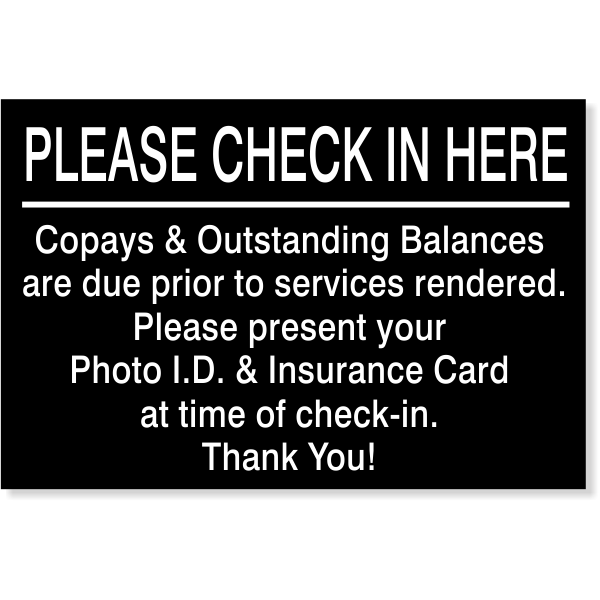 This wayfinding sign will easily direct your patients to their destination and the message telling them that Copays & Outstanding Balances are due prior to services rendered should allow your patients ample time to prepare when they sign in to expedite the customer service experience. Many engraving plastic colors to choose from. Choose how you would like your sign finished with round or square corners. In addition, you can choose how you would like to hang your sign. Don’t hesitate & order today. Most orders ship the next business day!